One of the first things you’ll notice upon entering the Elliot Park Hotel is the absence of a massive lobby desk. Instead, guests are warmly greeted by a doorman, who can direct you to a registration desk discreetly tucked under a floating staircase, surrounded by tasteful, invitingly soft sofas and hearthside accoutrements that coax the visitor to stop and sit a spell. Like every detail at Elliot Park Hotel, Autograph Collection the lobby is sized and designed to make guests feel right at home. Since its opening in September 2018 as the final component of the KA Block, Elliot Park Hotel has become an instant destination for business and recreational travelers, special occasions, and diners coming from around the block or around the world looking for fine dining and the spirit of Hygge. 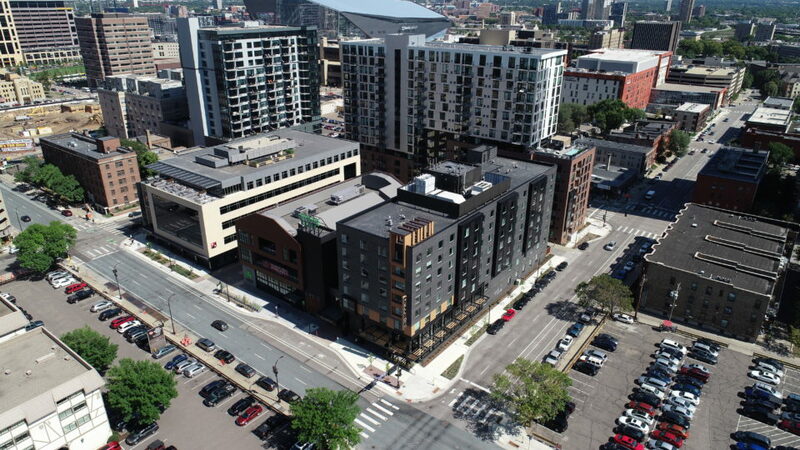 The hotel’s Senior Sales Manager Kevin Callaghan and Director of Sales and Marketing Troy Whelan, along with ESG Architects Vice President Ryan Freese, provide some perspective on what makes Elliot Park Hotel a special destination in East Town Minneapolis. Q: In recent years Minneapolis has undergone a resurgence in hotel development. What’s driving the demand? 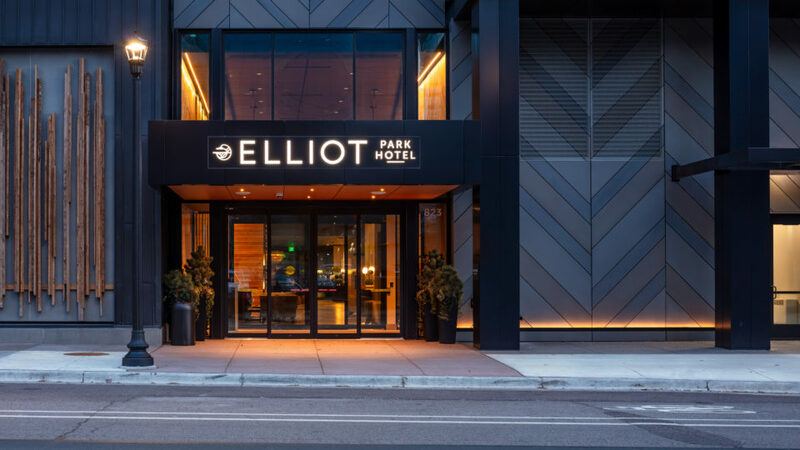 How does Elliot Park Hotel distinguish itself among the competition in Minneapolis? 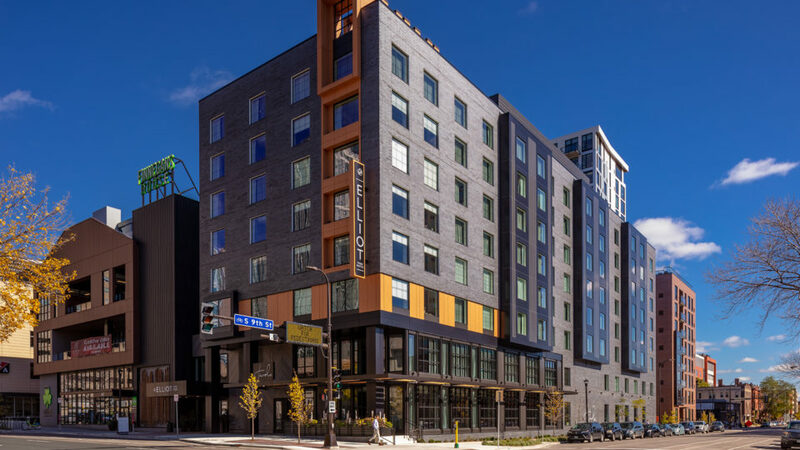 KEVIN CALLAGHAN, SENIOR SALES MANAGER, ELLIOT PARK HOTEL: Though there is no simple answer, it truly boils down to occupancy levels in Minneapolis versus other comparable markets. The largest recent factors revolved around our strong convention business at the Minneapolis Convention Center and the opening of US Bank Stadium in the redeveloping Downtown East neighborhood. Starting with the stadium: Minneapolis winning the bid for Super Bowl LII (which took place February 2018) presented an instant supply/demand opportunity to house tens of thousands of fans. This, coupled with our upcoming NCAA Men’s Basketball Final Four Championship, showcased the Twin Cities as an international destination, attracting the attention of a worldwide audience. Even though Minnesota is home to 19 Fortune 500 companies, the general consensus five years ago would not have placed the Twin Cities at the top of the list of national destination cities. That being said, Minnesota has been highly publicized for our cleanliness, beauty, and metropolitan style for the better part of a decade, especially in the advent of social media (think of those “Best Places to Live” articles). But to your point, 13 new hotel projects came up in this new boom and Elliot Park Hotel, Autograph Collection is one of them. How do we distinguish ourselves from other boutique-hotel offerings in the market? Q: At 8 stories and 168 rooms, this Marriott Autograph Collection boutique hotel leverages design details over massive scale. As project architect for the Elliot Park Hotel design, talk about some of the signature design features in the building. RYAN FREESE, VICE PRESIDENT, ESG ARCHITECTS: From a design perspective, it was developed around key words that describe the experience, attitude and physical spaces: Unforgettable, Community, Hygge. Unique touches and memorable moments are captured by the grand stair, large custom fire place, copper bar top, wood fired pizza oven and the wall of candles that are lit at specific times of the day. 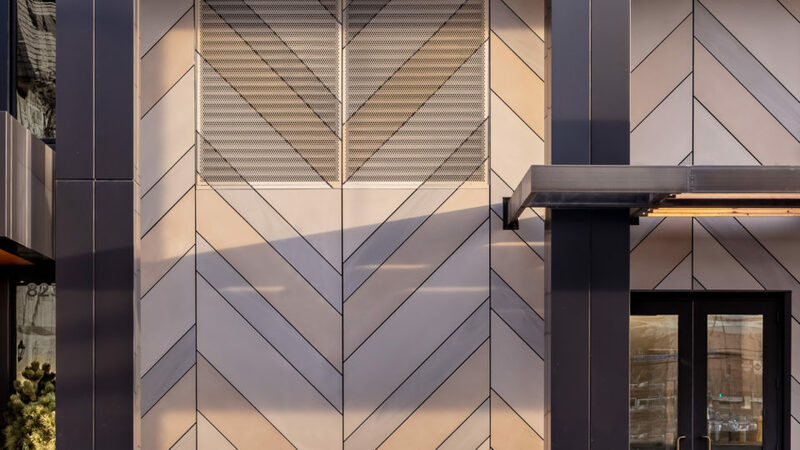 Exterior touches are the chevron patterned material and the vertical wood finished element at the corner extending to the rooftop feature. All elements used to evoke a feeling or moment that is Instagram worthy. On a macro scale, the design of a full city block around the internal courtyard used throughout the year is a way for the neighbors to come together. The chevron pattern on the exterior of Elliot Park Hotel is a unique design feature to the hotel. KEVIN CALLAGHAN: We have a lot of “home” elements in our rooms. A quick example would be the barn doors in front of our bathrooms. It’s great for square footage, but you see those kinds of stylized features in apartments and homes these days. When you walk in the door of our courtyard suites, there’s a little ledge to put your keys on the top and your shoes on the bottom, just like if you were at home. There’s a coat rack in the corner, so that room itself really feels like a studio apartment. Because we’re in the Elliot Park neighborhood and we’re so close to where all these residents are, we’re not staring at all these corporations – it’s really that neighborhood feel. Our rooms really feel like they’re residential, sort of a “home away from home” for our guests. On top of all that, there’s just these little Minnesota touches. Like these wooden awnings, they’re sort of a Minnesota signature. In the winter we’re cozy, we have the hearth, and in the summer we have the courtyard that goes right outside to Finnegans and you get that community feel. Q: In terms of overall ambience, Elliot Park Hotel is described as Hygge. What is that? KEVIN: Hygge (pronounced “hoo-gah”) is a quality of presence and an experience of belonging and togetherness. It is a feeling of being warm, safe, comforted, and sheltered. Hygge is about being, not having, and is often supplemented by the Danish notion of stemming or atmosphere. The large hearth (fireplace) in our lobby captures this essence, suggesting a common scene in Scandinavia where folks gather around the fire and spend time with those they love and enjoy. It’s a primal comfort; a way of being with other people, caring for them and ourselves. 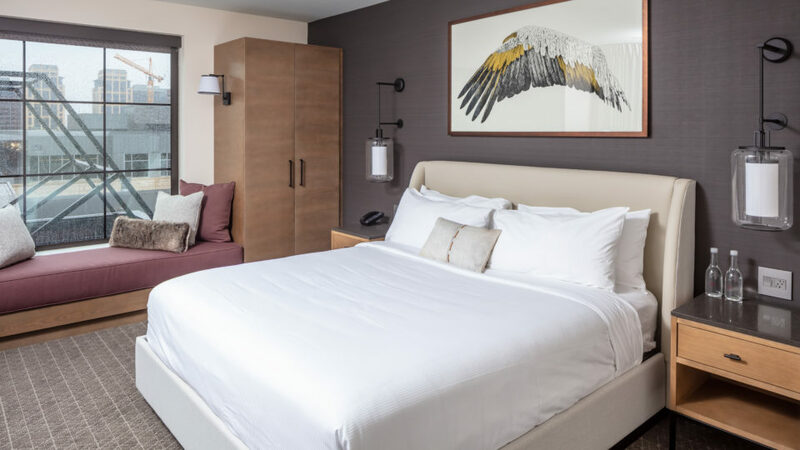 Elliot Park Hotel creates an environment where our guests can find their Hygge, something deeply singular to all of us. We do this mostly through our arrival process, getting to know where the guest has travelled from and their goals while staying with us. If we can hone in on the nature of their stay, coupled with any personal notes they are willing to share, our team is empowered to take the steps to provide a truly unforgettable experience for these travelers in Minneapolis. Most Autograph Collection hotels may have something tangible, like a drink or a gift, as something that’s special to their market. But Hygge is intangible. It’s individual for each guest. If you’re here for your brother’s wedding, we’re going to treat you a lot differently than if you were here for business. What I mean by that is if you’re going to be hanging out in the evening, maybe we have some complimentary wine. If you’re here for a business meeting, maybe we can take care of your transportation, give you some hand warmers, whatever you might need. We really try to personalize that experience for each person because we want them to find their Hygge while they’re with us. RYAN FREESE: This is captured with the use of warm tones of wood throughout, again the fireplace and intimate areas of comfortable seating, and the custom niche in guest rooms for a person to curl up with a good book. 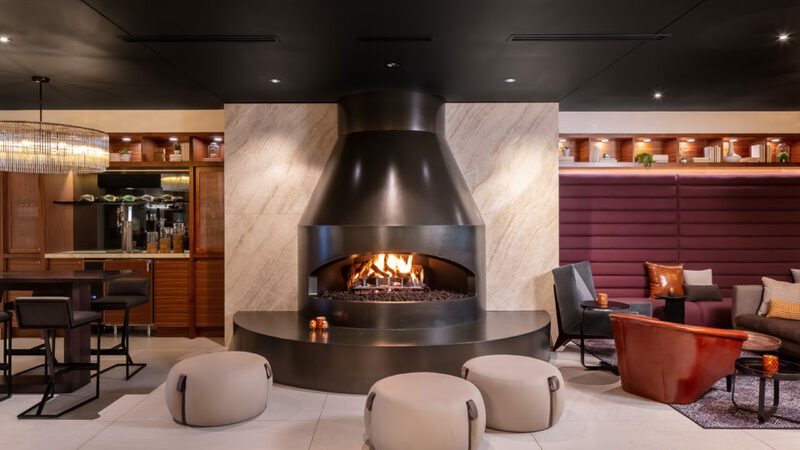 Elliot Park Hotel’s lobby encourages “Hygge” with soft lighting, comfortable seating and a custom hearth. Q: You used the term “individualists” to describe Elliot Park Hotel’s customers. Elaborate on that. KEVIN CALLAGHAN: It’s truly about celebrating the art of storytelling by creating memorable moments for our guests to cherish and share. We celebrate the individuality and the life-changing experiences that shape our guest’s unique narrative. With 168 rooms total, it’s very easy for us to know who’s in house and cater to their values. On that note, Marriott International’s Autograph Collection Hotels brand is well named, as each Autograph Collection Hotel is as unique as an individual’s signature. It is a distinctive portfolio of independently-rich, one-of-a-kind hotels. “Exactly Like Nothing Else” is the tagline, validated by each properties commitment to drawing their design and culture from their indigenous surroundings. For us: not only indigenous to Minnesota, not only to Minneapolis, but to the Elliot Park neighborhood where we call home. We know that our “individualists” are looking to engage with their destination during their travel and that is where our pride in Minneapolis really separates us from the market. We’re able to make specific decisions that other hotels may not have the flexibility to provide. One of these choices is as simple as our “Brew & Bite” where we have an opportunity to introduce each guest to one of Finnegan’s Brew Co.’s seasonal drafts through a tap right at our front desk, whose taproom is conveniently connected through our lobby entrance. Our guests want to collect these memorable experiences and share them with the world! Q: As a luxury hotel, how does the comfort of Hygge serve Elliot Park Hotel guests in terms of amenities? KEVIN: We have an Amazon Alexa in every room. Because we’re exactly like nothing else, we got to make that decision because we saw the cost and sustainability element in there. Not only does it make us more efficient because if you need a bath robe or extra towels, you can ask Alexa and that buzzes into our system. We can bring it up swiftly because it’s not clogging the phone lines and we don’t have to radio somebody. It also removes the need for a compendium, which is a book that is typically in a hotel room that has all the information about the hotel. You just ask Alexa. Beyond that, we have all the information on the television as well. Our in-room dining menu, for example, you can scroll through everything and when we make a change or if we update the seasonal soup, we can update the picture and we can update all the ingredients. The nature of northern Tuscan food is its very ingredient-based and ingredient-heavy. It’s important to make things fresh. We hand roll our pasta every day, so if we change the ingredients because we have to alter some things, we can put it right there and we don’t have to reprint 168 new copies. It sounds kind of silly to say we’re saving with each book in each room, but it really makes a big difference. In the grand scheme when we’re here for 10 years and never have to reprint, that’s a major footprint – it’s hard to monetize but its easily understood. 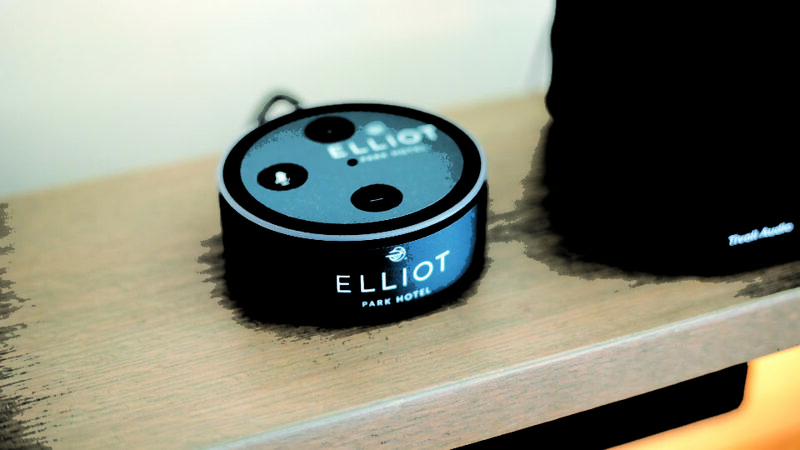 Each room in the Elliot Park Hotel has an Amazon Alexa for guests to request items, order room service or ask questions about the hotel. Q: Tavola Italian Kitchen + Bar is attached to Elliot Park Hotel and provides a restaurant in an area where dining options are limited. What was the vision for including this restaurant and how has it come to life? KEVIN CALLAGHAN: It’s very valuable for the hotel. We have to service our guests breakfast, lunch and dinner. Typically, if you have a third party restaurant, it’s tough because you have to be open late and you have to be open early. That’s what a hotel is. We can really subsidize the restaurant, and the restaurant can really subsidize the hotel, and it really makes sense that we’re all under the same bottom line. When you come in from the lobby you’re coming in from the bar side. Not saying anything, but typically hotel folks are bar-driven. And of course the street entrance goes into the restaurant, where we can really service the community. These apartment buildings that are around us, we spent a lot of time prior to our opening really meeting the residents and letting them know we’re their new neighborhood restaurant, because I know personally that these folks will walk across the city to get a good meal. So the fact that we’re only a couple blocks away from all these residents, they were excited that we’re here. And they’re not going to stay in the hotel – yes, when they have family come in we always have an open door and a discount policy for them because they’re in our neighborhood – but these folks are here to spend time in the restaurant. We have regulars, which is great so that when guests come in, it’s not a guest-only experience. We have people that have a rapport with the bartenders, which is that character value you get when you have a good culture and a good staff. The hotel is the success of the restaurant and the restaurant is the success of the hotel. 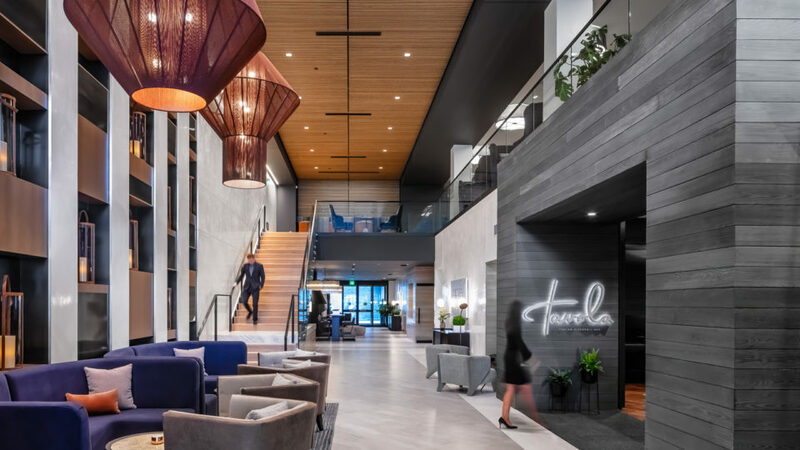 Tavola is attached to Elliot Park Hotel’s lobby and provides Italian cuisine for guests and locals alike. Tavola also caters to the events we put on in our meeting spaces. We have a full catering menu with plenty of options, so you’re not limited to an Italian menu. It’s delicious of course, and it’s headed by Executive Chef Aaron Uban, who is very well-known in the city. Q: Minneapolis has a lot to offer. How do you engage the individualists who want to go out and experience the city? KEVIN CALLAGHAN: We have an Experience Center – It’s not a gift shop, it’s really a vision of our CEO Paul Coury. We’re really trying to get our guests out into the environment. In fall, for example, we give guests a picnic blanket and a picnic basket with a curated lunch, and we circle spots on a map where you can have an outdoor picnic in Minneapolis. We have the MN Nice Ride bikes right outside, and we tell them, “Hey, go check out the Walker Art Center, or the Stone Arch Bridge, and have a picnic there.” We’ll circle it and tell them right where it is. Minnesotans haven’t even done a picnic on the Stone Arch Bridge, right? If you’re not from Minnesota, whether you’re staying here for leisure and your family is here or you’re a business traveler with a day to kill, we want it to be accessible. That’s the vision of our CEO and why the Experience Center exists. TROY: We showcase local artists and business there too, like Love Your Melon, we sell some Finnegans merchandise and local artwork – it’s really to showcase our partners and kick people out into the world to check out what Minnesota has to offer. Q: How has Elliot Park Hotel been able to connect with the growing community in East Town? KEVIN: One of our pillars is community, and we see that with Finnegans being a non-profit beer company, and we see that with Kraus-Anderson’s rejuvenation of this area. That really tied us in with House of Charity, which is really our next door neighbor. There’s so many opportunities to help, and we really wanted to focus on something tangible that we could do. We volunteer mostly with the brunches on Saturdays to feed their folks. We really feel like we’re making a difference because we see these folks a lot, and we’re living and working in the same area. It’s really great to involve yourself in something that’s in your neighborhood. You can see the tangible benefits and it really opens up your heart. You meet these people face-to-face and you’ll see them again because it’s the nature of living in the same area. I think that’s really the strongest thing that connects Kraus-Anderson, Finnegans, and us, it’s this community pillar and a similar vision. Elliot Park Hotel shares the block with the KA Headquarters, Finnegans House, and HQ Apartments. Q: The Elliot Park neighborhood is really transforming. Moving forward, how do you see this growth continuing? TROY WHELAN, DIRECTOR OF SALES AND MARKETING, ELLIOT PARK HOTEL: Kraus-Anderson is a valuable part of the community. They’ve done so much. I still remember the old headquarters – it was just a big parking lot with the original building. It was cool to see that they’re making this decision to tear down, temporarily relocate, and then make this whole development. It’s a big initiative from Mayor Jacob Frey to either give a surface parking lot some landscaping or just build up and build down. Things are developing fast, and we came here at a great time. Minneapolis is no longer a fly-over city. It’s growing, we’re growing with it, and it’s a real positive thing.